A hemostatic device developed by the military to save lives in the battlefield could soon be saving lives on the dangerous streets of the USA. 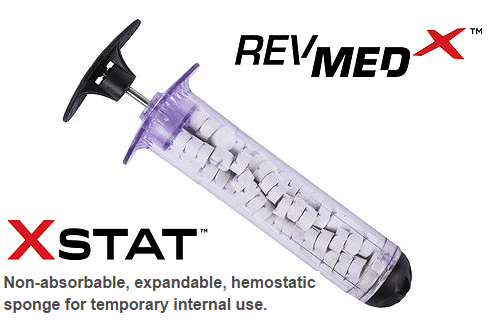 The FDA has approved Revolutionary Medical Technologies’ XStat Rapid Hemostasis System, a first-in-kind syringe that pumps scores of tiny sponges into gunshot or shrapnel wound cavities. Each sponge contains an x-ray detectable marker and once inside, the sponges expand and swell to fill the wound with 20 seconds of contact with blood. These devices can help prevent hemorrhaging deaths that are estimated to account for up to 40% of all civilian deaths from traumatic injury. The FDA says the device stops bleeding in places like the armpit where a tourniquet cannot be placed and it lasts for around four hours. The device is designed to temporary use for patients at high risk for immediate life-threatening bleeding where the victim cannot get care at an emergency care facility within minutes. The FDA approved the device for military use more than a year ago and with the rise in mass shootings, XStats will be made available to civilian first responders at a time when they appear to be most needed.